by Conor Magee MD FRCS. The gastric band is commonly performed in Europe and Australia. Despite the huge obesity problem in America it has only recently been authorised for use in the United States. The gastric band is the simplest bariatric procedure. It is usually done as a laparoscopic (keyhole) procedure. It takes around 30-40 minutes to do and usually requires an overnight stay. Although many different types of gastric band are available (e.g. LapBand, AMI band), the principles are the same. A soft, adjustable collar (the band) is placed around the top of the stomach and then buckled. This creates a stomach pouch. Some stitches are placed to secure the stomach around the band to prevent it slipping out of position. The band can be inflated to grip the stomach tighter. The band delays the passage of solid food from pouch into the stomach below the band- this gives rise to a sensation of fullness, "restriction", even with very small portions. The patient is forced to eat slowly and chew foods very carefully. The band makes patients feel full quickly and hence reduces appetite. The band can be inflated using a small port that is hidden under the skin of the chest wall at the time of surgery. Over a period of months the band is tightened in clinic by injecting fluid into the band through this port. The band filling is relatively pain free and does not require anaesthetic. Over several months the band is tightened until restriction and weight-loss occurs. The advantages of the gastric band lie in its simplicity and safety. The death rate associated with the gastric band has been reported to be as low as 0.08% although recent scientific reports quote 0.5%. The simplicity in placing the gastric band means complications such as damage to the stomach, spleen and gullet are rare. One particular advantage of the gastric band is its flexibility for the patient. The band can be adjusted according to the patient's degree of restriction-if restriction is lost the band can be inflated further. Similarly if there is too much restriction the band can be deflated. The gastric band tends to "bank" the weight loss- by this I mean that once weight is lost it can stay lost and not be regained. This is mainly through the change in eating habits and dietary choices the gastric band patient has to make. The gastric band is a purely restrictive procedure; this means that nutritional deficiencies are unlikely. The fact that the gastric band can be removed can be attractive to some patients. In addition, the gastric band is the cheapest bariatric procedure. The gastric band is heavily promoted in the media as the answer for all patients with morbid obesity. However, there are drawbacks to gastric banding which need to be pointed out. The gastric band is an effective means of losing weight although it is felt to be the least successful bariatric procedure in terms of weight loss. The gastric band generally achieves 50-60% excess weight loss at two years. The weight loss with a gastric band tends to be slower than that of other procedures such as the gastric bypass. Generally, a correctly filled gastric band will allow you to lose 3-4kg per month. Most of the weight-loss will tend to take place at 18 months to 3 years following surgery. Some people do better, some people do worse, but overall this is the kind of weight loss we expect. Am I Right For The Gastric Band? This is an interesting question, and there is no clear-cut scientific answer! There have been some studies that suggest women with a BMI of less than 50 who are willing to change their dietary habits and exercise do well. It's best to think of the gastric band as a tool. If used properly it will work wonders- you can lose 100% of your excess weight- but you have to do the work! And this is important, remember the 50-60% excess weight loss I mentioned? There is a little bit more to it- those figures represent patients who are suited to the band. In clinic when I talk to patients many people are surprised that they may not be suitable for a gastric band. They have read the adverts that suggest that all you need to lose weight is a band, but this is not true. Remember my description of the band- all it does is hold up the passage of solid food. People whose dietary weakness is full sugar soft drinks, or meltable high-calorie soft foods such as chocolate will not have any hold up. These foods will slip through a correctly adjusted band and weight loss can be less than expected. You will need to change your eating habits to get success from a band. This is a point I re-emphasise in clinic- you must be honest with yourself, if chocolate is your weakness can you stop eating it if you have a band fitted? A gastric band is not an easy short cut to weight-loss. The band will alter your eating habits enormously. You will need to chew, and chew, and chew, and chew, and chew, and chew, and chew and chew again. In fact you must chew for 1 to 2 minutes before swallowing and only then swallow and eat very s-l-o-w-l-y. You should only drink half an hour after a meal! Food choices for patients with gastric bands are usually varied, however there are three foods that are very difficult to eat- white bread, boiled rice and red meats. Again, I ask my patients are they willing to forgo these if they have a band fitted. Patients who are particularly big, those with a BMI >50 may not be suited for the band because a 50-60% loss in excess weight may still leave them dangerously overweight. Patients who have type 2 diabetes may not benefit as much from a gastric band (around 60% of patients improved at one year); we know that over 80% of type 2 diabetics can be cured by other procedures such as the gastric bypass. However, the safety of the gastric band makes it an attractive option for people who feel that the risk of the gastric bypass or duodenal switch can't be justified, for example the young mother with a newborn child. For patients with significant heart or lung disease the gastric band may be the safest choice of operation, and the band can still achieve meaningful weight loss with significant benefit. I mentioned the low incidence of operative complications earlier. Surgeons describe these as early complications, late complications are problems that develop weeks to months after surgery. A gastric band has few early complications but more late complications. One late complication of the gastric band hardly mentioned in the media is the re-operation rate. 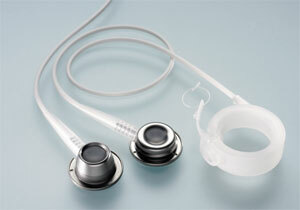 Around 10-15% of gastric bands require further surgery. If you are having a gastric band it is vital you find out what would happen if you needed further surgery- is it covered in the package price you are paying to a private surgeon or company, or would you have to pay again? Would the NHS fund a second procedure? The reasons for re-operation include infection at the port-site or serious complications such as band erosion into the stomach or more importantly band slippage. Sometimes the stomach can be forced through the gastric band, becoming trapped and strangulated. The stomach can then lose its blood supply causing peritonitis. This is a surgical emergency and requires immediate assessment by your surgeon. A patient with a slipped band will have difficulty in swallowing foods they can normally eat; they may even have difficulty swallowing liquids. Some patients have severe heartburn and can even vomit blood (either fresh or looking like old coffee grounds). Thankfully it is quite uncommon, but we know that over-tight bands can predispose to it. Some bands are deliberately overfilled to provide rapid "restriction" with the aim of achieving rapid weight loss. This is not safe- such an approach leaves a patient with persistent retching and vomiting- features that run the risk of band slippage. Experienced centres ensure that band tightening is done gradually and under close supervision to prevent unfortunate events such as band slippage taking place. The gastric band is an effective form of bariatric surgery. Although not the most effective in terms of weight loss, it is the safest procedure available. Patients who use the band appropriately can achieve fantastic weight loss. Remember that the gastric band is still around 5-6 times more effective than diet and tablets! Although it does have the drawbacks above, a patient suited for the gastric band will do very well. A gastric band can be life changing, but patients need to be aware of the whole picture.